Too may salespeople getting too stressed because they don;t know the magic formula to sell their product. Learn the magic of selling and creating advertising that sells. Isn't it a shame that what you were taught in schools — even the best business schools– doesn't work out in the real world. That's because people don't learn how their own buyers think and react. Barry Feig, marketer/consumer behaviorist has been troubleshooting for product and service companies for over twenty years, developing new marketing strategies and positionings, products and marketing opportunities for corporate giants such as American Express, First Brands, Colgate-Palmolive, American Cyanamid, Pepsico, etc. In 1986 he founded Barry Feig's Center for Product Success (formerly New Products Workshop), where he guides companies through the labyrinth of developing and marketing successful products, using his untraditional "the consumer drives the market" approach. He also speaks regularly, around the world, where people stand in line to hear about what drives purchase behavior. The products and strategies he has created have generated sales in excess of $2 billion and include such familiar products as: Glad Lock Storage Bags, Colgate Baking Soda with Peroxide, Colgate Junior Toothpaste, American Express' Gift Cheques and Membership Saving's Program, Arm & Hammer Dryer Sheets, Ralston-Purina's Kibbles & Chunks and Lucky Dog dog foods, R.T. French's Vive La Dijon, and Deli Singles. He has also created a medical glove that is revolutionizing burn treatments in hospitals across the country. He has just opened up an internet division offering help on website development and website promotion. He didn't do these things alone. He did it by exploring the hearts and minds of buyers. In a way never done before, he learned the hot buttons of buyers and narrowed them down to the sixteen hot buttons that produce virtually every sale. 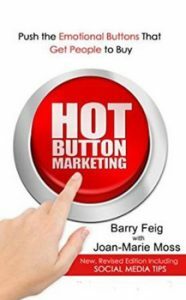 Visit him at Barryfeig.com, hotbuttonmarketing.net or explore his books. They're like nothing you've ever heard or read before.